ABBA was a pop music group formed in Stockholm, Sweden in November 1970. 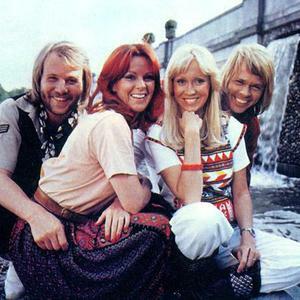 The band consisted of Anni-Frid Lyngstad (Frida), Bj&ouml;rn Ulvaeus, Benny Andersson, and Agnetha F&auml;ltskog. (See also Bj&ouml;rn Ulvaeus & Benny Andersson, as well as Benny's previous band Hep Stars.) They topped the charts worldwide from 1972 to 1982 with eight studio albums, achieving twenty-six #1 singles and numerous awards. They also won the 1974 Eurovision Song Contest with Waterloo. They topped the charts worldwide from 1972 to 1982 with eight studio albums, achieving twenty-six #1 singles and numerous awards. They also won the 1974 Eurovision Song Contest with Waterloo. A jukebox musical based on the music of ABBA titled Mamma Mia! opened in London's West End in 1999 and has since become one of the most popular musicals in the world. In 2008, a movie version was made with Meryl Streep among the cast. The recent Rock and Roll Hall of Fame 2010 Induction Ceremony, held on March 15 in New York, recognized the huge contribution of ABBA. Represented by Anni-Frid Lyngstad "Frida" and former husband/band member Benny Andersson, it was perhaps the crowning acknowledgment of the phenomenal success of Sweden's most famous four.